One of my four year old son's absolute favorite things to do right now is to find hidden pictures in his "Look and Find" books. 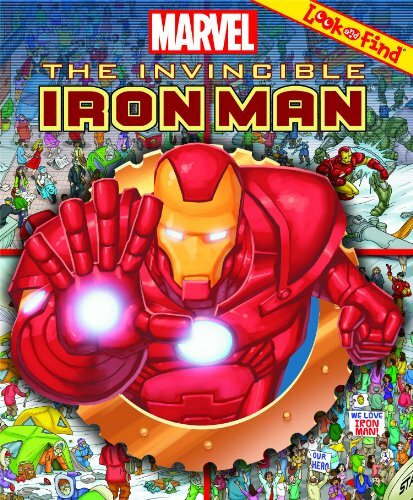 He especially loves the new Iron Man, Avengers, and Spiderman Look and Find books that Santa brought him for Christmas. We actually have a special Mommy/Son time to look for hidden pictures after story time and sister's bedtime each night. My son is really getting quite good at finding pictures and can sometimes spot an object faster than his mama. I love this time of the day, just a little one-on-one quite time with my boy. Recently I found a neat book on one of our trips to the public library. I grabbed it on a whim from one of the top shelf displays. 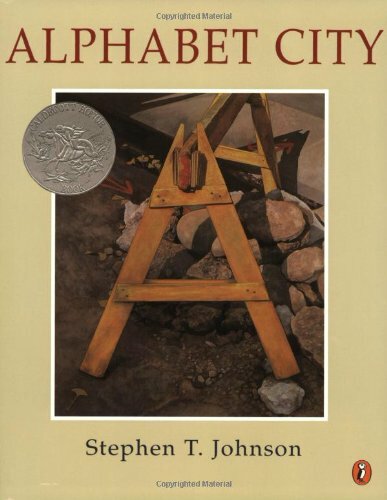 The book was called Alphabet City by Stephen T. Johnson. The book doesn't have any text, but is compiled of a series of paintings of uppercase alphabet letters found in a city. My son and I really enjoyed flipping through this book and trying to figure out where the letter was on each page. It was also great because my son could practice tracing the letter with his finger to show me that he had in fact found where the letter was. and an O on the top of the paper towel dispenser. Now we are in the midst of a household hidden letter mission. It's my hope that after seeing a few of my examples, my son will start to find some of his own. I'll keep you posted on how that goes. What letters can you find around your house?